A great way for tourists to keep a memory of Korea even after they leave would be traditional souvenirs that contain the culture, history and beauty of Korea. Although food and fashion items are great, we suggest you consider these items; hanbok (Korean traditional clothes), pottery, fans, good luck pouches (‘bokjumeoni’ in Korean), or other crafts that are either handmade or contain high artistic value. These have been the popular picks by tourists for many years. They all make beautiful gifts and are readily available throughout the country for purchase at reasonable prices. Hanbok, a type of traditional Korean clothing, is now only worn during national holidays or weddings. 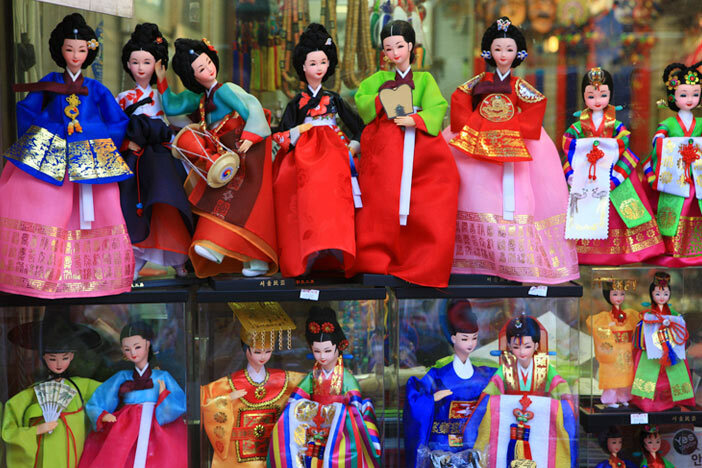 The beauty of hanbok is in its smooth, artistic lines and its vibrant colors. Recently, many female celebrities prefer wearing hanbok over western-styled dresses for the merit of hanbok’s flexibility and beauty enhancing designs. Hanbok was not considered complete unless worn in the appropriate traditional manner. However, in recent years, the wearing of hanbok has become greatly simplified and modernized. The designs are endless but are divided into major styles; formal and lifestyle, adults and children, female and male, and also seasonal. The price normally falls in the range between 100,000 and 300,000 won, although the fabric and accessories used will make a huge difference in the price tag. In addition, hanbok has been gaining a lot of attention from international fans thanks to many hallyu dramas and films portraying the costumes. Famous shops frequented by visitors are located near Insa-dong and Samcheong-dong, all close to major tourist attractions. Related Columns Experience the Beauty of Hanbok! A Day Full of Fun, Tour Seoul in Hanbok! Pottery (“dojagi" in Korean) is a compound noun of the words “dogi” (earthenware) and “jagi” (porcelain). In Korea, pottery is divided into four types: porcelain, earthenware, stoneware, and clayware, all come in various sizes and functions. In fact, Korea is known internationally for its long history of producing porcelain teacup and plate sets. They all boast the finest quality, making it the top item on many visitors’ wish list. Small dishware or dojagi-made accessories, such as exquisitely crafted key chains, are not only good for carrying around, but also great at showing one’s love for Korea and its wonderful customs in valuing traditional arts and the aesthetics of slowness. A popular place for tourists to treasure hunt for these items is Insa-dong, where you can find almost anything made with dojagi, priced from just 10,000 won and up. Along with dojagi, Korea has a proud history of excellence in arts and crafts; for example, najeongchilgi, folding fans, and luck pouches. There’s no better way to remember your time in Korea than by taking home one of these lovingly-crafted, traditional pieces. ‘Najeonchilgi’ is a traditional mother-of-pearl craft in which beautiful patterns made of shells are inlaid into wood and coated with a lacquer finish. Folding fans are essential items during the summer and excellent souvenirs to consider. Bokjumeoni luck pouches, mini-quilts, knots, or charms embroidered with traditional Korean patterns are also widely found in many shops at Namdaemun and Dongdaemun traditional markets and Insa-dong. This page was last updated in September 20, 2018, and therefore information may differ from what is presented here. We advise you to check details from the official websites before visiting.